Occasionally in life we have moments of clarity when the blinders of routine fall away and we see things we somehow never noticed before. This kind of clarity can affect the way we look at our friends, our partners, our habits… even our cookbooks. The realization that hit me recently, in a flash of stomach-shrinking horror, was the uncomfortable fact that I have never cooked a single recipe from more than half the cookbooks on my shelf, despite the massive amount of blood, sweat and cash I’ve invested in my collection (which has, over the years, been dragged across continents with me). That’s not to say I’m not familiar with the food within; every book I buy spends at least a week or so on my bedside table while we get to know each other intimately. I often go so far as to make notes about which mouthwatering things I intend to make first, and many books on my shelf have little telltale fringes of multicolored post-it notes peeking out from particularly enticing (but as yet uncooked) recipes. Apart from being entertained, I do know that I learn a lot from simply reading these cookbooks, and I imagine that I’m also gradually accruing a sizeable mental arsenal of techniques that I’ll be able to apply to other things I cook. I also know, however, that no amount of reading substitutes for getting one’s hands dirty. So with that in mind I have set a goal for the next few months: to bring my cookbooks one by one out of hibernation, and to introduce them to a part of my house few of them have ever had the good fortune to meet – the kitchen. A couple of weeks ago, I chronicled a dinner that I had made from recipes in a new cookbook of mine, Crazy Water, Pickled Lemons. What I really enjoyed about that meal, apart from the fantastic recipes, was the way that by cooking everything from one cookbook I really got a feel for the tastes of the author and the style of food within, and the meal seemed to have a kind of coherence that I often don’t get when I assemble recipes from different sources. I decided this would be a good thing to do whenever I have the opportunity, and it would allow me to cook several recipes from some of the books I’ve been neglecting. All I need is the occasion, namely a few extra willing mouths who will risk the gastronomic unknown in exchange for a potentially decent meal. This weekend I had the perfect opportunity, as my delightful parents-in-law were visiting and claimed to be willing to eat whatever I wanted to serve them. As the basis for our meal, I chose a cookbook that has been on my shelf for about a year, has lots of little pink and orange tags poking out, yet inexplicably has never been used. The book is called New World Kitchen: Latin American and Caribbean Cuisine, and it was written by the well-known Miami restaurateur Norman Van Aken (chef-owner of the eponymous Norman’s). The food in this book covers a lot of ground, as indicated by the title; Jamaican jerk teams up with purple potatoes from Peru, mojos from Cuba and moles from Mexico. Many recipes are traditional, and many are his own interpretations of ingredients that are common to these regions. What appealed to me most were the bold flavors and unusual combinations – things like chicken and rice stewed in coconut milk with pigeon peas, currants and green olives; conch salad with pickled onions, sweet peppers and watermelon; and guava marmelade-filled fritters with vanilla cinnamon-sauce – clearly New World food reinvented for the new millennium. Another thing the book has going for it is Mr. Van Aken himself. Unlike many chef-authors who either have no discernable personality on the printed page or else are finicky and pedantic in their instructions, Norman is humorous, charming, and relaxed in his cooking style. He also has many informative and entertaining stories to help explain the history and traditions behind his recipes. The only problem I encountered, which I realized may have been the reason this book had never been used, is that many of the ingredients he calls for are difficult-to-impossible to find here in Scotland (conch, taro, Peruvian dried potatoes? Forget it! ), and he doesn’t consistently suggest substitutions. Other things may be available but would have taken some serious sleuthing to find, and I unfortunately had limited time to procure the ingredients I needed. So, after carefully considering my options, I chose the most interesting recipes I could make with the ingredients available to me, and hoped for the best. Over the next few days I’ll be posting the recipes from Norman’s book that I chose to make for dinner last weekend. I set out with the intention of remaining as faithful to the printed recipes in this book as possible. I did end up making a few alterations, perhaps changing quantities or combining elements from different recipes, but overall I behaved myself remarkably well and resisted the urge to deviate too much. The first installment of this meal was a light, refreshing, yet very fragrant salad, which everyone loved. I combined two separate recipes to make this, the coconut almond snapper and the grapefruit vinaigrette. The construction of a salad with the avocado and grapefruit segments was my own invention. I would feel free to experiment with the fish used (my mother-in-law intends to try it on salmon), and I imagine that jumbo shrimp given the same treatment would be exquisite. 1 1/2 pounds snapper filets (or other firm white fish), cut into 3- to 4-inch-long "fingers"
Preheat the oven to 350F/180C. Begin by spreading the almonds and coconut (if using fresh) on a baking sheet and toasting lightly in the oven for 10-12 minutes. Put the almonds in a food processor and grind coarsely, then mix with the coconut in a shallow bowl. Set about 1/4 cup of this mixture aside for sprinkling over the salads. In another bowl mix the flour with plenty of salt and pepper, and in a third mix the coconut milk with the cayenne pepper and Tabasco. Season the fish fingers with salt and pepper. Dip them first into the coconut milk, then coat in flour. Dip again into the coconut milk, then coat completely with the coconut-almond mixture. Leave them to dry on a plate until you are ready to fry them. Heat the oil in a heavy pan to 350F/180C. Doing only a few at a time, slide the fish fingers into the hot oil and fry just until cooked through, not more than 2 minutes, turning halfway through. Remove to a paper towel and repeat with remaining fish. For the salad, heat the olive oil with the garlic in a pan until it just begins to get fragrant. Quickly remove from the heat and let infuse for 20 minutes. Strain the oil into a bowl, discarding the garlic. Mix the oil with the honey, vinegar, salt and pepper, and two tablespoons of the reserved grapefruit juice (see next step). Arrange the mixed greens of individual plates. Peel the avocado and thinly slice. To prepare the grapefruit, cut the whole peel off with a sharp knife, trimming off any bits of pith or membrane that you miss (the flesh should be exposed). Working over a bowl to catch the juice, remove the individual segments one by one, cutting on either side of the separating membranes, and dropping the freed segments into the bowl. What you should have are grapefruit segments with no membrane attached. 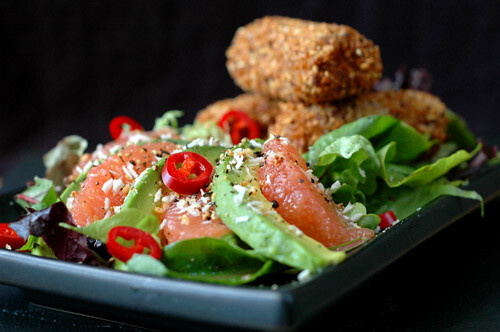 Lay the avocado and grapefruit on the greens, drizzle with the dressing, and lay the fish fingers on top. Garnish with a sprinkle of the reserved coconut almond mixture and a few slices of red chile pepper. Serve immediately. Note: I liked the salad very much as is, but I think it might be even better with mangoes instead of grapefruit. The fish fingers themselves would be very good as a finger food, but I think they would need a dipping sauce, preferably something sweet, spicy and garlicky, or perhaps a fresh fruit salsa. I know what you mean about not using the books. I have probably a small collection compared to yours, maybe 70 books currently. I’ve probably cooked recipes verbatim out of only 5 of them, and 4 of those were for baked goods, which I don’t feel comfortable improvising with. The other was an interesting-looking curry that took me five hours to prepare and did not turn out well.Usually, though, I just use the books for ideas — new flavor combinations I hadn’t thought of, interesting techniques or ways of doing things I haven’t yet tried. Then when it’s time to cook, sometimes a little spark of inspiration flies! Collecting books that we don’t really use for their intended purpose seems somewhat odd, but cookbooks are very comforting, to me at least. Flipping through the pages I feel like I’m holding the keys to great cuisine… And it makes me hungry! By the way, have you looked at either of Alton Brown’s books or the America’s Test Kitchen books? Both are more technique than recipe focused, and as such are very readable and good for pulling ideas from, rather than using as rote instruction manuals. Brilliant! Im very excited to watch how this unfolds for you. Im again amazed at how perfect the dish looks, you have a gift for food styling my friend! (not to mention photography, writing, and obviously cooking) :)The fish fingers sound great, and I like your alternative suggestions for them and for the salad as well. I will anxiously await the next installment.. I must agree with Michele, Melissa. You’ve got a great talent for food styling. Everything looks well composed, yet not too posed (if that makes any sense). And it looks tasty! Dear Melissa,I already knew, that we’re both hooked on cookbooks, but your cute post reveals more alike behaviour. I think you easily can distinguish the cookbook pros (aka the really “nuts” people) from the amateurs: The pros (at least a charming expression for the addicted) have lots of cookbooks AND lots of post-it notes within AND ALSO additional lists, which dish to soon cook… ;)The slipping avocado brought back some surpressed yet lively memories about a bouncing duck breast… on christmas eve… do I need to go any further? I'm wondering why do we have to preheat the oven to 350F/180C when we are frying the fish fingers in oil. Maybe a typo? Or can I actually bake the fish instead of frying it? I'm gluten free, so I'll replace the AP flour with a GF flour but I'm so going to give it a try. It looks so yumm!